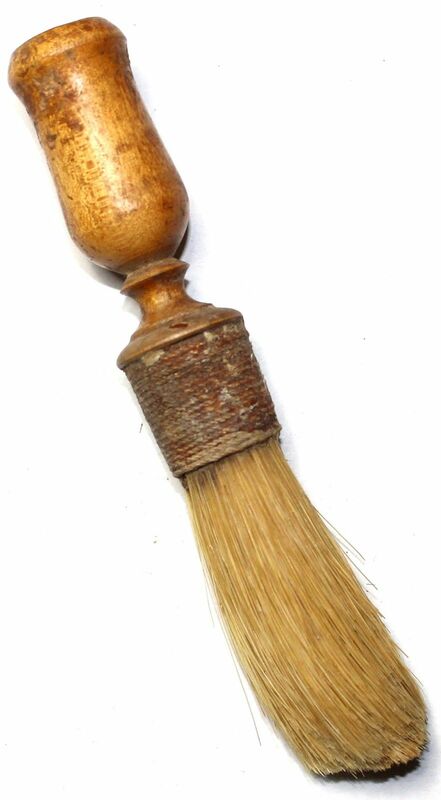 Some more photos of old shave gear I found online, this time brushes from around the time of the US Civil War. Three things that strikes me right off the bat is the use of string or twine to secure the knot, the length of knot in relation to the diameter, and the narrow neck between the knot and the handle. While the use of a string to secure the knot most likely was due to the lack of modern glues, and the extreme length of the knot can be down to either the hair used or just the style of the times... the narrow neck probably had a practical purpose; to stop water and lather running down the handle. Cool. These are the precursor to the vintage barbershop handles from the 1900's. Any idea what the knots are made of? Is it horse hair? (11-09-2017, 03:06 PM)Cincinnatus Wrote: Any idea what the knots are made of? Is it horse hair? I would love to know. Horse was common in brushes before the anthrax-scare, but I have no idea what these are made of. I have one identical to the second left in the OP. It came out of an old Pennsylvania farm house and has been dated to the US Civil War era. 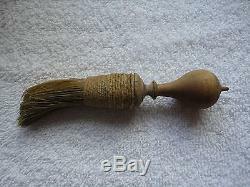 I'm pretty sure it's made of boar bristles. Horse would be finer, I think. Take that back, now I'm pretty sure it's made with horse hair. I was confusing brushes. Just went up and looked. They look more like neck-dusters to me than shaving brushes. When I was a kid, our barber used one of these. I doubt they were made of boars hair as I recall them to be quite soft. Reliable sources state these were shaving brushes, and the wear pattern on some of the ones I saw online (including the ones I posted in the original post) seems to indicate that use. Also found a couple of forum posts on collectors forums that seems to indicate that horse hair was the fibre of choice. My guess is people, or at least the owners of these brushes, bowl lathered.